Agam has created the FH7690 extrusion used in conjunction with the FH7690 End Plate. As a designer at Agam, I am continually presented with exciting challenges which enable me to apply my skills and explore my abilities in order to create the best new products for our customers. 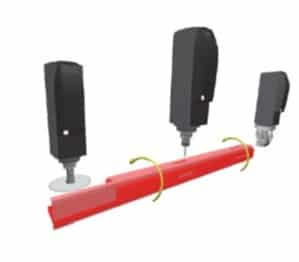 Recently at Agam, we have received numerous requests for designs requiring the use of SEG (silicone edge graphics) to turn corners while also being structural enough to create especially large tradeshow booths and displays. For this purpose we have created a new extrusion: the FH7690 used in conjunction with the FH7690 End Plate. Through design iteration and prototyping we were able to create a system which meets all the prerequisites of our clients. When I was designing the end cap for this system the key challenge was to create a product that served several functions but was also easy to use. Another important factor would be its ability to disappear behind our clients’ graphics; by being unobtrusive it would not burden the design of our clients’ displays. Once I was content with my final prototype, I had to deal with the nuances of full-scale production. 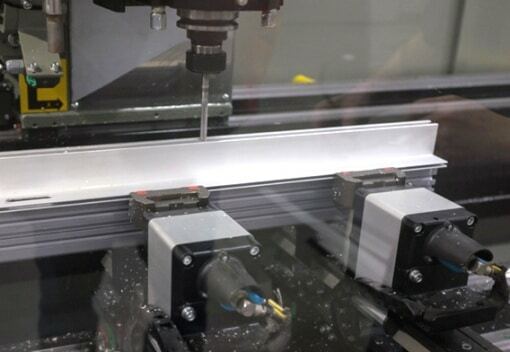 Its manufacturing process begins with our Laser Cutting Center, where it cuts aluminum plates of two different thicknesses in order to achieve perfect fitment for our SEG Gasket. These aluminum plates are then inspected and assembled using countersunk screws intended for a flush surface. These screws are also used to fasten the plates to a custom insert block which can be secured to the new FH7690 extrusion. The finished FH7690 End Plate is then sent through our powder coating oven for a durable painted finish. Watching the above YouTube video will visually explain how to assemble an FH7690 cube featuring the FH7690 extrusion, FH762 extrusion and FH7690 End Plate. It reviews the components needed and the steps taken to create a cube. It even shows how fabric is inserted into the channels and also shows some design ideas. 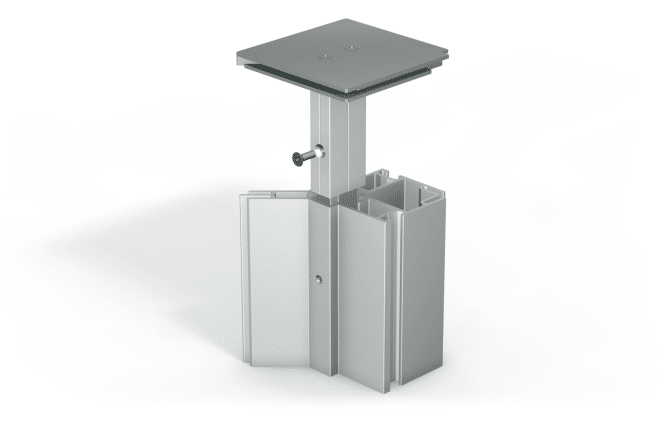 When constructing a display or tradeshow booth, the FH7690 End Plate is installed into the top and bottom of the FH7690 vertical extrusion posts using a countersunk screw inserted into its custom insert block. 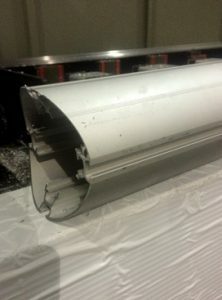 After this, the FH762 horizontal extrusions can be connected to the FH7690 verticals by tightening their CBX connectors with a hex key. The result is an end plate that not only covers the ends of the FH7690, but also acts as a symmetrical point of convergence for 8 different fabric channels. This creates continuous channels in which SEG Fabric can be inserted, allowing designers to create seamless fabric cubes without having to “jump” fabric around inside and outside corners. In addition to fabric cubes, this new FH7690 End Plate can be used to create entire rooms of seamless SEG fabric due to its inside corner fabric channels. We recently received a game changing piece of machinery which takes our already industry-leading custom capabilities to another level. With 4 controlled axes, our new Aluminum Machining Center becomes a versatile tool in manufacturing custom displays that make the ultimate statement. The Aluminum Machining Center allows Agam’s extensive line of profiles to be customized with extreme precision and efficiency. 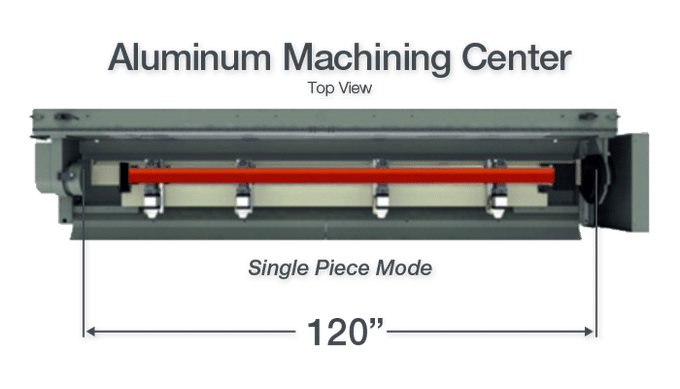 What makes the machine unique from others that we own is the continuous rotating work table that allows machining from -90° to +90° on extrusions up to 120” in length! 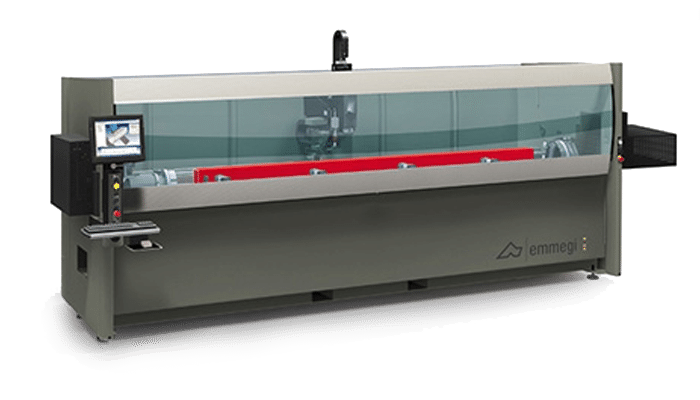 In addition to milling custom slots and holes in our profiles; this machine allows us to think outside the box and discover solutions to problems once thought to be impossible. 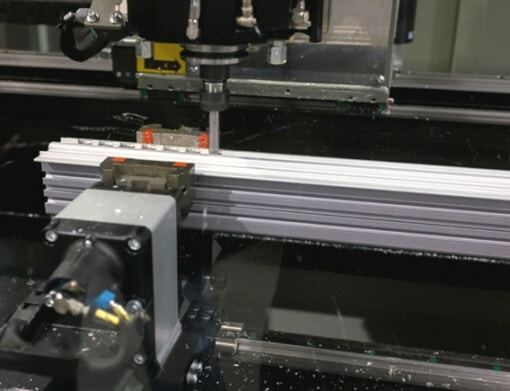 We are able to program the Aluminum Machining Center to do complex operations such as grudging our 108mm (4 ¼”) round VR108 profile and the results are top-notch! The following is the video of the Aluminum Machining Center machining the VR108 profile, demonstrating its precision and efficiency. *Please note that the machining portion of the video has been increased by 4x to keep the video short. To learn more about this exciting new machine and what it can do for you, please contact your Agam representative today! Agam has five designers on staff, each of them with a strong background in various fields of design. They support the project management teams, providing fully engineered solutions to customers and support for the fabrication specialists in the plant. So, it is only natural that they create new products based on the recommendations and requests they receive from our clients. Whether it’s a conference room or a storage closet, every inch counts in the exhibit design industry. The sliding door allows designers to maximize space and create privacy at the same time. The track is made of extrusion MR1200 and the door is made of extrusion PH1070 or PH1003. 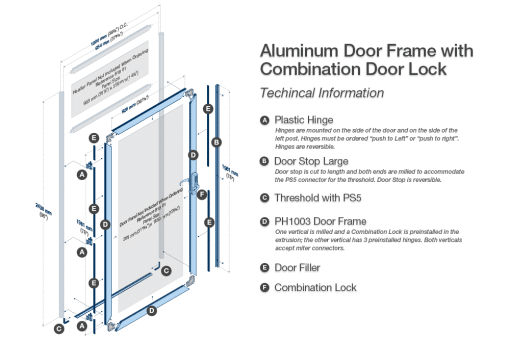 Agam can cut these extrusions to any length, so the sliding door can fit any doorway. You could even replace your current swinging door. Or, if your doorway is large enough, Agam can make a double sliding door. It has an upper track that attaches to the partition after the fact. Simply build the wall using only a hex key or use an existing wall, and then simply add the upper track with a clever specially designed part. The door can then be hung in place and slides using two roller brackets, which hook onto the track. The sliding door can be locked with a key for security. The spring-loaded lock is attached to the door and bolts into the track. The newly designed ergonomic handle gives more space for the user’s fingers and allows the door to close tightly. As innovative designers at Agam, we are constantly creating new extrusions and accessories to benefit our customers. The Agam Aluminum Modular Display System’s components interlock to build attractive exhibits, displays, store fixtures, office environments or anything you imagination and creativity will allow! Email us at contact@agam.com or give us a call, toll-free, for more information at 1-800-645-0854. Agam’s new Combination Door Lock is a substantial upgrade for customers who demand the highest quality, security and flexibility. 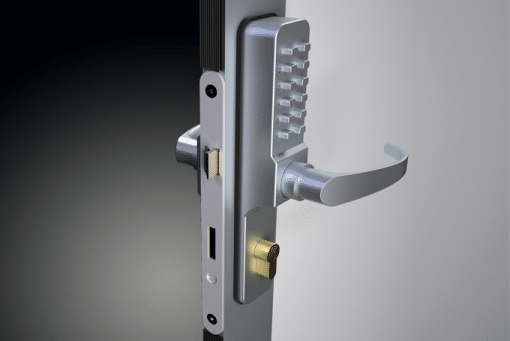 Unlike other offerings, this new unit consists of an integrated lock and handle rather than separate components. Keeping up with keys on the show floor can be challenging to say the least. No longer will you need to decipher which key goes with which lock and receive multiple requests for replacement keys from clients/customers. With 8,000 possible pass code combinations, the new Combination Door Lock can be tailored to each customer. Combinations can be changed on show site giving you ultimate control. And since it offers a matte chrome finish and cast alloy construction, it is built to last. 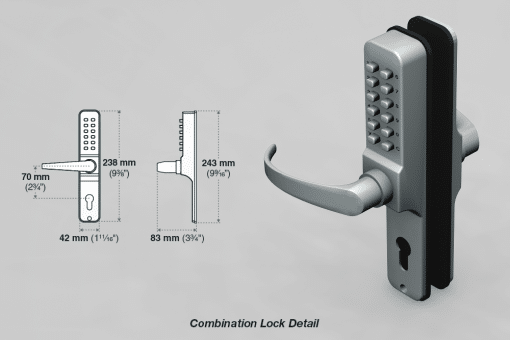 The Combination Door Lock is available for purchase now and can be purchased as part of a Combination Door Frame Kit (Reference: 818 01). Please send an email to contact@agam.com or contact your sales representative today to receive more information and pricing. Display designs over the last 20+ years have incorporated more and more curved elements. Though curving is both an art and science, it is one of Agam’s fortes. Agam provides unparalleled service by consistently giving our clients custom curves that meet their exact specifications in a timely manner. Robert (photographed to the right) is our Lead Curve Specialist. He is responsible for overseeing three CNC roller benders; two saw stations and up to three employees that work in his department. Bending curves is an art and science because aluminum extrusions change properties based on age and temperature. So, even if Robert writes programs for the different extrusions and radius’s, they cannot be 100% perfect the first time and “tweaking” always needs to be done. For your next project, explore how the use of curves can enhance and help distinguish your display. Our sales team, designers, and production staff are ready to assist you with your next project.